Chris Sullivan and Susan Kelechi Watson talk about their hit NBC TV show, This Is Us, why you may not be able to binge watch previous seasons and Susan and Chris tell Nessa who would make them starstruck. Glenn Howerton sits down with Nessa to chat about his NBC show, A.P. Bio, why he surrounds himself with smart people and he reveals what he would be doing if he wasn't acting. Ben Feldman joins Nessa on the stoop to chat about the fourth season of NBC's Superstore, why he is so exhausted since becoming a new dad and what one day job he had in New York. Abigail Spencer talks to Nessa about NBC's Timeless, why she loves to play strong women and why she is always living in a state of exhaustion. 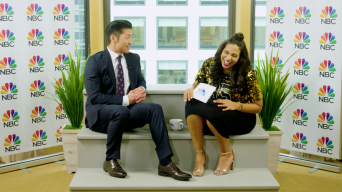 Brian Tee talks to Nessa about his NBC show, Chicago Med, how he feels about the Asian-American roles in Hollywood and whether or not he's an impulsive person.